Don’t allow your company to sleep-walk toward its demise. If you face “commoditization creep,” take these steps before the point of no return. Cuyahoga Falls, OH (January 2016)—Think of your company’s most exciting products—the ones that drive the bulk of your profits. Who invented them? If the names of retirees come to mind, your company could be in trouble. Now consider the products your company has launched in the last five years. Are they innovative blockbusters… or do they look suspiciously like your competitors’ products? If you’re developing “me-too” and incremental products, you’re not innovating. You’re producing commodities—and that, says Dan Adams, is very bad for business. 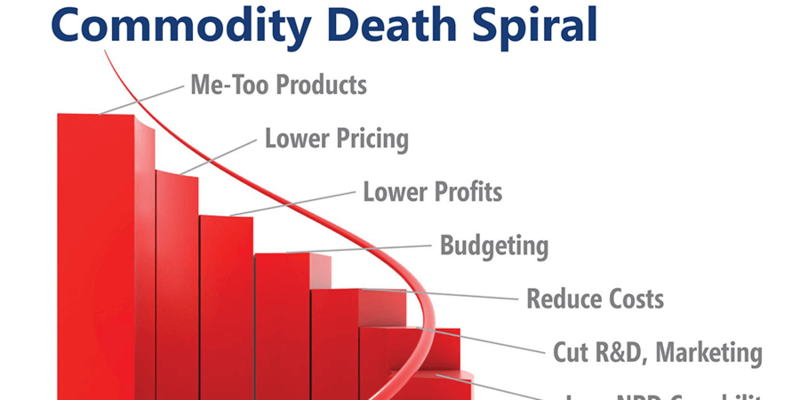 If any of this is sounding familiar, your company is experiencing the “commodity death spiral.” It’s a business-busting decline that begins with companies creating me-too products that lead to budget cuts, driving even less new product development capability…especially for high-impact new products. Read on for some tips from The AIM Institute. Founded in 2005, the Institute works primarily with Fortune 500 B2B companies eager to boost their innovation results; their real-world experience may help you avoid the commodity death spiral. Change your time horizon. In a 1972 Harvard Business Review article, Richard Vancil complained that long-term product development expenses are buried within short-term operating plans, allowing short-sighted business leaders to “raid” funds needed for their future. Few would argue that this problem has gone away since then. Work on high-impact, high-innovation products. Some companies play it safe and work on only “low-risk” me-too and incremental new products. But this feeds the commodity death spiral, so this strategy marks the beginning of the end. Those who sacrifice innovation on the altar of safety end up losing both. Research by Nagji and Tuff (Bansi Nagji and Geoff Tuff, Managing Your Innovation Portfolio, Harvard Business Review, May 2012) makes this point clear: Among high-performing companies such as Google, 70% of return on investments came from transformational projects… not adjacent or core projects. Get out more to minimize risk. While it’s risky to incrementalize, it’s also dangerous to invest in “great-hope” projects: high-stakes gambles with lower odds than management realizes. These kinds of projects pull in lots of manpower, funding, and management attention. But after two or three years, they often end with a whimper, typically from a fatal flaw that should have been discovered much earlier. Level 2: Ask Our Experts: Polling your sales force, tech service, and others to determine customer needs. Level 4: Qualitative Customer Interviews: Sending interview teams to hear the voice of the customer. Level 5: Quantitative Customer Interviews: Adding numerical feedback to drive out bias and wishful thinking.